Honestly, I never heard about tomato pie until I lived in the south. Even then, for some reason, it just held no appeal for me…oh boy,was I blind. Finally, after several “suggestions” from Pinterest, I decided to give it a go. Pleasant surprise…despite the simplistic nature of the ingredients, it truly tasted…well, just like a fresh summer day. Let me give you the recipe! 5. 1/2 cup mayonnaise…I use full fat, I assume reduced fat would work, if you try it let me know. 6. 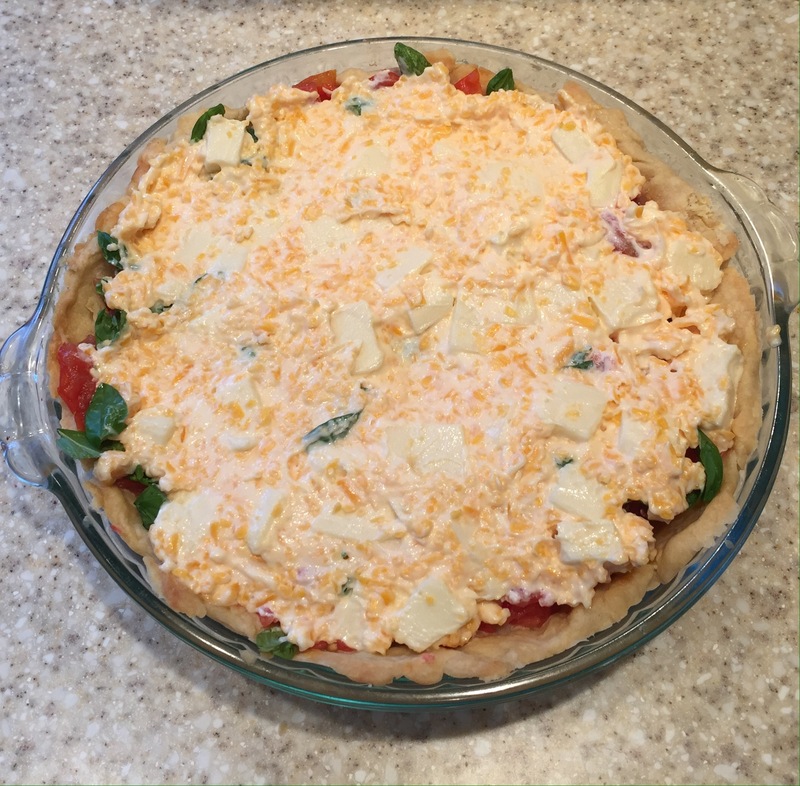 2 cups chopped and shredded cheese…I use whatever I have on hand, for this pie I used cubed mozzarella and shredded cheddar. 3. Mix mayonnaise, cheese and hot sauce together until it is the consistency of a “slushy snowball” and spread on chopped basil…gently spread! 4. Bake 30-40 minutes in a 350 degree oven…I don’t cover it. 5. Remove, cool and enjoy! It has been a busy weekend here…and as you can see even the Princess has her limits. It made for a good naptime however! 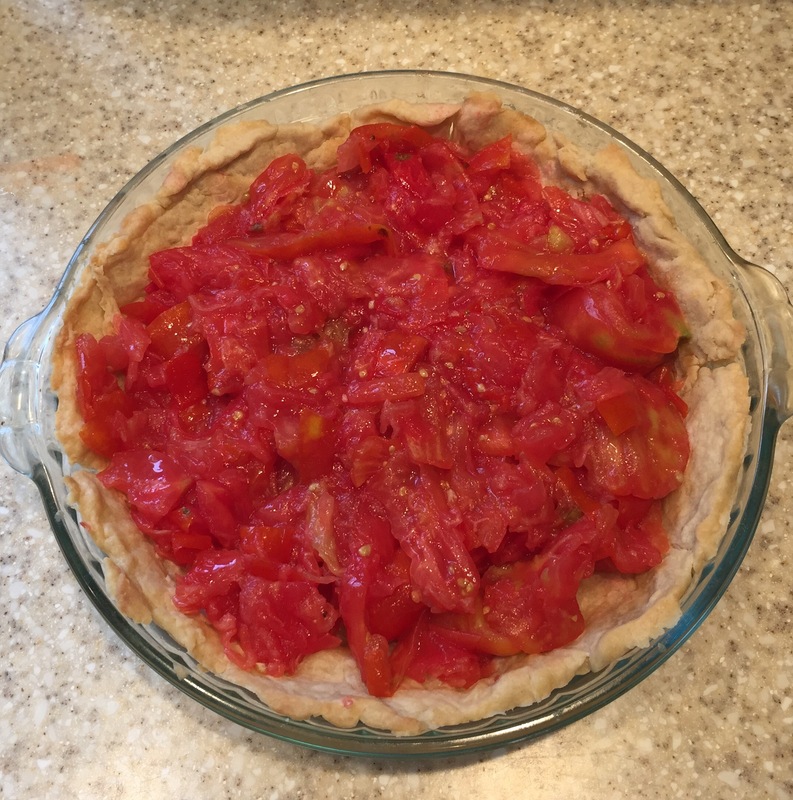 I have never had Tomato Pie, but your recipe seems easy enough for even me to try. I don’t know anyone here in New England that makes it, so I guess it is a Southern dish. Always need to be open to new things don’t we? The Princess is always beautiful- love the photo! Too cute!! Thank-you for this recipe and lovely post. That concept was just so odd to me. I grew up in Philadelphia so I truly think it is a southern thing. Glad I gave it a try. It was enjoyed by all this evening! Interesting! Will try it ! Thanks! I love tomato anything! I like your recipe for tomato pie and I’m going to add it to the ones I already have. I think yours is easier!!!!!!! Thanks! So easy to add and change this recipe. Corn adds a great sweetness as well! I never heard of tomato pie. I love anything tomato, I am going to give this a try. I know, the concept just seems strange but it really is delicious. The hot sauce kind of makes it boy friendly. 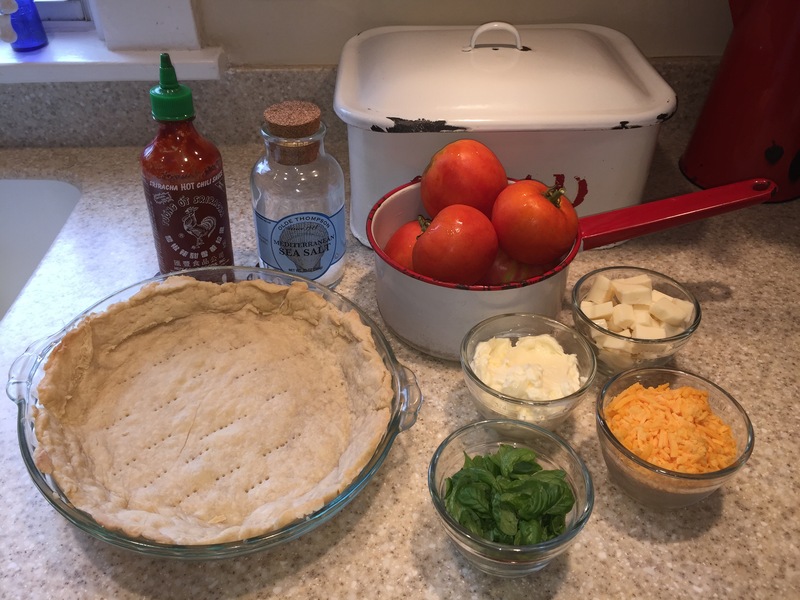 I have made Tomato Pie for years from recipe I found in Southern Living, I believe. 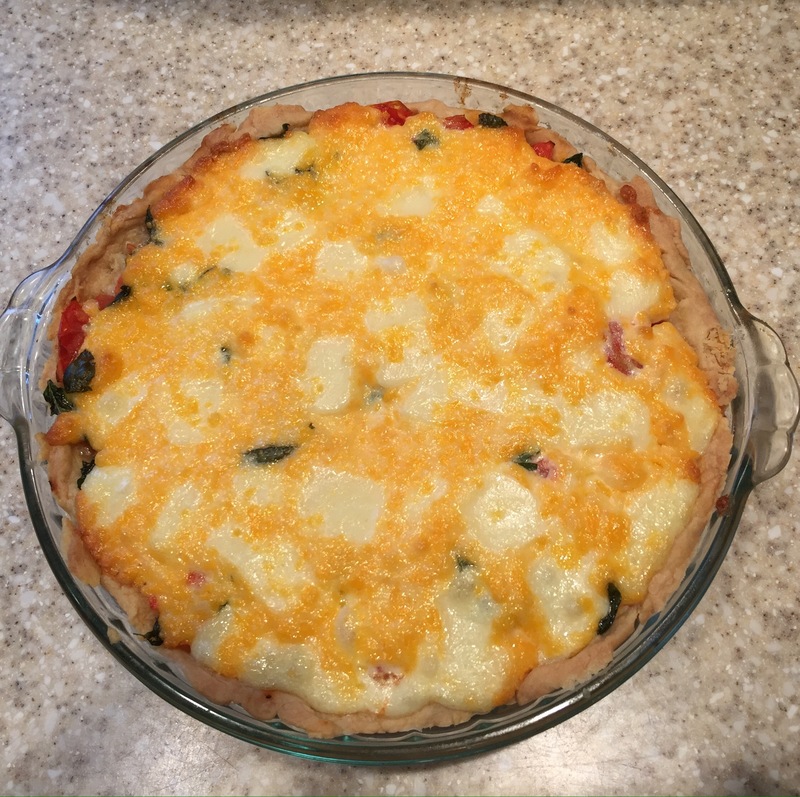 Quite similar to yours, but mine calls for 1 cup diced onion, 4 quartered and sliced medium tomatoes, 1/2 cup shredded parmesan cheese, 3/4 cup shredded sharp cheddar cheese, 1/4 cup chopped basil, and I always have used 1/2 cup LIGHT mayonnaise. I use the Pillsbury piecrusts which come two rolls in package. This recipe calls for 1 baked pie crust and to make two layers of all ingredients. I love this so much I make them many times during the summer and even eat a large slice for breakfast with coffee. (The addition of hot sauce in yours sounds good also). Good…I am going to use the light mayo next time. I love to switch up the cheeses and use what I have on hand. Feta is also very good. I am so glad to have found thIs recipe. Summer on a plate I think. Oh my, indeed! This looks divine! Ooooooooh! This looks quite tasty and easy too! On my to-make list! I have always wanted to try tomato pie but never have. It would have to be wonderful with those ingredients. Pure summer! I didn’t hurt to have the tomatoes and basil right in the garden ! Sounds yumtastic! I have never made a tomato pie. I have never made this either. But I love anything with tomatoes and cheese. It could even be the refined cousin of pizza. Pinning. I like that! Classy pizza. I have never had tomato pie but it sure looks good. Amy, This pie looks so good and it’s filled with great ingredients to it must be delicious. Thanks for sharing. 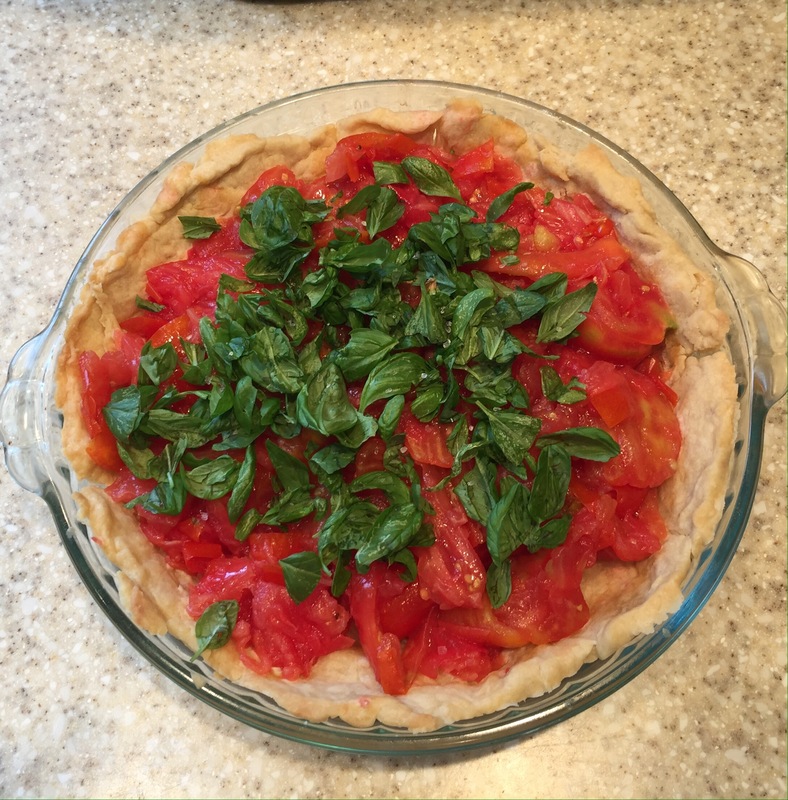 Sylvia D.
I have never tried a tomato pie, the ingredients are simply and sounds great! Never heard of a tomato pie, but it truly looks delicious! Thank you for sharing the recipe with us at Brag About It. Pinning to share 🙂 Have a fabulous week! Oh my word, this looks and sounds so delicious! Thanks for sharing on Sweet Inspirations (that’s where I found it). I’m definitely pinning this one! I have never heard of this before either, and it looks amazing! We love anything with tomatoes, this would be a great lunch or dinner! Will pin it to have it for later for sure!! Just made another one tonight and added some fresh onions. Very tasty! I have never heard of tomato pie, but I think with the juice squeezed out of the tomatoes I just might be able to eat it!! I certainly looks delicious!! Thank you for sharing at TaDa Thursday!! Great recipe and looks so yummy. I would eat this with a lovely salad. Yum! Thank you for sharing at Dishing it and Digging it link party. We love having you. We enjoyed it with hunks of homemade sourdough bread! I too have never heard of tomato pie but does it ever look good! I am always looking for new recipes and I love tomatoes and cheese so I will have to try this. Thanks for sharing the recipe, Amy. Amy, I love a tomato tart and this one looks easy and delicious. Thanks for sharing at Your Inspired Design. What a tasty looking pie. Wish I had the skill to have handmade crusts in the freezer! Thanks for linking up at Welcome Home Wednesdays! Love all things made with Tomato and would love to try your recipe! I love tomato pie! We even have a restaurant in a neighboring town called “The Tomato Pie Café”. Would love to make this so I’m copying your recipe down! Thanks so much for linking up… tomatoes have been a staple in many a kitchen for like…well, forever! I have made two more the last few weeks…bacon was an awesome addition. I love tomatoes…especially fresh from the garden. I’m visiting you from Something Old is Something New blog hop. This post looks so delicious! Thanks for sharing!